I think I was 4 or 5 when I was riding my aunt’s banana seat bike at my grandparent’s house. It was way too big for me, but I didn’t care. I rode around their farm yard, up and down the grassy hills and on the gravel drive. But I think I was 6 when I got my first bike. It was dark ocean blue. My dad brought it home one day. I was so excited!! We lived on a really long gravel drive way, so even though I kept falling and skinning my knee, I kept getting back on. Our yard was large with a lot of trees and I was always riding in the dirt, grass and woods. Then when I was 14, I took my first paycheck from lifeguarding into the bike shop (I think it was still on Winnebago back then) and said. “I have this much, what will it get me.” They said, “This is the only bike we have that will fit you.” Lucky for me it was in the price range and it was a Trek 820 Antelope, which was kind of a MTB back in 1992. It is typical for people to find themselves with more than one bicycle. Tell us about yours! My favorite bike is a bike I no longer have. Twisty, because it was really fun and meaningful. Fit like a glove. My second favorite bike is Ruby, the road bike, because it signified a change in me back to who I used to be before kids, which was free spirited, active, and healthy. My third favorite bike is Mr. Blue, who I now use as a gravel bike and kid pulling bike, but was the mountain bike I bought with my first paycheck ever and who I have relied on as my primary transportation through college, because I did not have a car. My least favorite, unfortunately, is my new mountain bike, a Trek Top Fuel. It's a really nice bike, but it has some quirks, and it is just a hair too big for me because it isn't women’s specific designed. I haven't even named this bike yet and I've had it a few years. I don't see it as being a long term bike in my life. I would like a new Trek built to the specifications of my old Twisty bike, because it was perfect. One day.... one day. I guess I should name it Mason the Muddy Mutant! Freedom. When I am biking, I feel free from all the responsibilities and stressors in my life. I have always been an independent soul. Each kind of riding has a place in my heart. I think gravels are awesome. I love the wide open rural roads Iowa has to offer. Mountain biking is a close second. If my skill level continues to improve, it will probably become my favorite. Every mountain bike ride is a good one, even if you fall or get injured. Sometimes you find morel mushrooms, sometimes it’s a deer or squirrel that adds humor or interest. Sometimes it’s just the trees in the wind. Or accomplishing a new section of trail, or getting muddy. It's all good. Paved riding is either family time for me or triathlon time, both of which I love. But you forgot urban riding. There is something fun and risky about zipping around town and jumping off curbs and over stairs that gets the heart pumping. I would also add night riding is quickly becoming a favorite, no matter when or who it is with, as long as my lights are charged. Tell us more about your triathlon experience(s)! Triathlons. Yes. 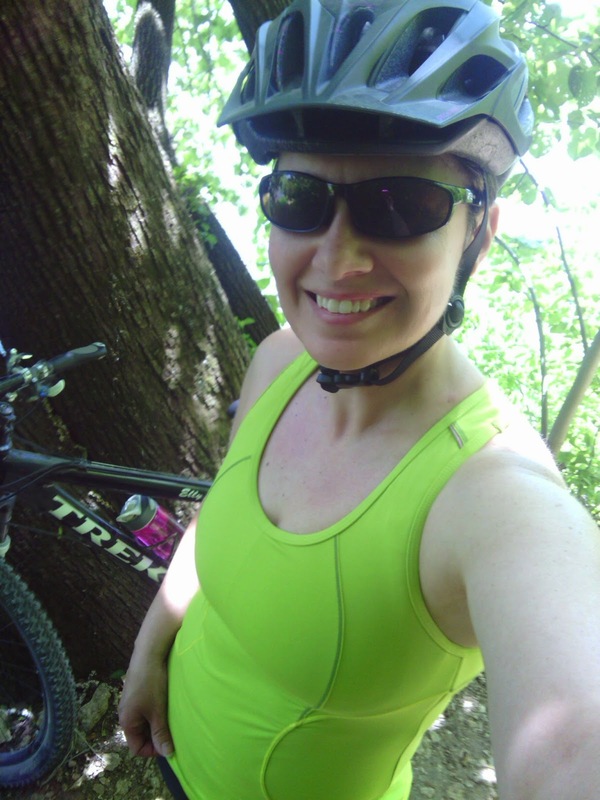 When I got back into biking again after having my first kiddo, I was pretty out of shape. A friend of mine at work asked me to be the run leg of her triathlon, because she could not run due to bad knees. My thought was, "darn, I can bike and swim, but not run" but I hated to let down a good friend. So I agreed. We had fun, came in dead last, but it gave me some hope that I could get back in shape. So I started walk/running the treadmill at work and weight started flying off. But, I really wanted to do my own events. I didn't want to be on a team. I went to one bike shop and said, can you build me a tri bike. Obviously out of shape, the guy looked at me kinda weird, and said, "Probably..." but didn't really seem to have interest. So I left and went to a different bike shop. Walking around, I noticed a black and hot pink Specialized Ruby Expert. I fell in love with it instantly and I told the guys, don't sell this bike. I want it. I probably went back 8 times and made sure that they didn't sell the bike, because it was going to be mine. Finally I had enough money and also took advantage of some credit, and I got completely outfitted. Ruby, blinged out with pink anodized parts, car rack, bike shorts, new helmet, the works. I started riding and had almost forgotten how much fun it was. So the next winter, I signed up for the La Crosse Got Energy Sprint Triathlon as an individual. Nervous. Excited. I drove up early that morning, and got my numbers and was not last. I was just glad to have completed it. Nearly every summer since then I do at least one triathlon because I love swimming and don't dislike running too much now. I think the hardest triathlon was the one I did 2 years ago. Having had a baby not that long before, and having not trained AT ALL because it was a difficult pregnancy, I was not prepared for that race. It was the one in Red Wing, where there are a lot of hill climbs. I was pretty screwed. The day before, for my daughter's kids traithlon, the weather was beautiful!!! But the day of my race the weather was pretty crappy. I was one of the last people to get into the pool, but amazingly, I was not the last person to cross the finish line, and during my run, I passed people, which made me feel accomplished. I can't wait until my 2 year old is a little older and I can go to more races; maybe make it a family event. One day we do a kids race, and then next day we do the adult race. I don’t remember my very first mountain bike ride, because it was probably back in high school, but I remember mountain biking in college on trails in Minnesota and then coming back here to Decorah and thinking, whoa, these are some serious trails! My first mountain bike ride in my recent past I had a really nice Trek and I was so scared I would scratch it that I didn’t ride authentically. Now I have a really nice Trek, but I don’t care if I scratch it. I just do it. I was really nervous the first time I tried some of the switchbacks. It was so rocky or root-y in places and I didn’t have a lot of control back then. I have clipless pedals on all my bikes. (mtb, gravel, road) I would just tell people to do it. You can’t judge it unless you try it. I prefer it, unless I know that I’m going on a trail still fairly new to me and I have a mental block about part of the trail. Then I switch them out to my knobby flats. It works. I have commuted from my house on gravel to work before. My concerns are never about the biking part, but more about the time factor and getting showered in time and where do I park my bike, because where the bike racks are here aren’t really near where my office is, so I worry about someone taking my bike. I don’t because I don’t want my clothes in my bag to get destroyed or wet, as I won’t time to pedal back up Quarry Hill Road for new stuff and make it in time with new clothes. 1 HUGE bike biff and a lot of small biffs. The smallest biff was just trying to jump a curb and I oddly lost balance and fell over. I felt like a dork. I just laughed that one off. Medium biff last fall was in Van Peenen Park. I tried to turn too tight, hit a tree, tumbled over scraping my leg pretty badly. My biggest biff was near ice cave on the river trail. Easy trail, but it was my first time attempting a pretty sizable log for me. Completely flipped! Head over heels over bike, clipped in and all. That one hurt. Honestly, that day I think I was done with it. Typically now I just come back to that place and do the same ride until I master it with no wobbles or problems. Consider it conquered and move on to something more challenging. Last week I wrecked pretty bad trying to climb the hill from the river trail up to Ice Cave road, and it made me really paranoid to keep riding that day when I went to Van Peenen. Every time I came across rocks I got off because I didn't want to fall clipped in again. It’s always better to keep riding and not let yourself get too flustered if you have a fail moment. It happens to all riders at some point. What would you say has been your most meaningful bike ride? A lot of them are meaningful. I think the time I attempted to ride the 100 mile Spring Training Ride was pretty meaningful and funny. I think we made it 32 miles is all. It was about 46 degrees and raining and the person I was riding with had to tinkle along the way. Cracked me up. Probably the most meaningful: It's been difficult for me to get my hubby involved in riding for various reasons. Santa brought him a custom blue bike (Mr. Blu #2) and it wasn't really being ridden. Was beautiful bike art in my basement for a long time, but the interest wasn't there. So for our anniversary last August, I got an overnight babysitter, bought super awesome bike lights and took him on a midnight bike ride around the paved trail and through the urban sprawls of Decorah. We got home at the wee hours of the morning. And it was the BEST! He now loves his bike and now even rides it in to work sometimes. I think biking brings people together and you can't argue with having fun people in your life with common interests. What do you love about riding your bikes? Everything. The physical benefits are immense. The psychological benefits are well worth it, and the emotional benefits and sense of freedom attained from biking are wondrous. Above all, makes me feel young at heart and brings a smile on my face, the kind of smile you get from skipping when you’re a little kid. It’s all good.